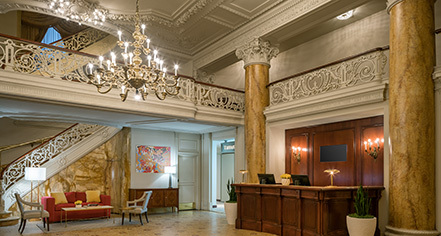 The Bellevue-Stratford Hotel is a landmark building at 200 South Broad Street, at the corner of Walnut Street in Center City, Philadelphia, Pennsylvania. Constructed in 1904, it has continued as a well-known institution for more than a century and is still widely known by its original, historic name. The hotel closed in 1986 and the building was converted to a mixed-use development in 1988. It has since been known as The Bellevue. The hotel portion has undergone minor name changes since reopening in 1989. On December 1, 1996, Hyatt took over management of the hotel, placing it in their Park Hyatt boutique division and renaming it the Park Hyatt Philadelphia at the Bellevue. The two restaurants and Founders bar were re-designed by Marguerite Rodgers as XIX (NINETEEN) Café, Bar, and Restaurant in 2007. In 2009, all four balconies outside the cafe and restaurant were restored and opened to the public for the highest outside dining experience in the city. In 2010, the hotel was moved from the Park Hyatt to the Hyatt division and its name was shortened to Hyatt at The Bellevue. In 2018, the hotel realigned into The Unbound Collection by Hyatt and become The Bellevue Hotel. The Bellevue Hotel, a member of Historic Hotels Worldwide since 2017, dates back to 1904. Notice the width of the guest hallways? They were specifically designed to allow the dress of the day, Victorian gowns with hoop skirts 6 feet wide, to easily maneuver with grace. Cribs and Pack-in-Plays: Cribs available upon request. Extra Person Fees: Fees vary, dependent on type of room booked. Parking: We are pleased to offer guests parking in the adjacent PARKWAY Bellevue Garage, easily accessible via the sky bridge. Maximum height clearance for the garage is 6’4”. For oversized vehicle parking information, please contact our Concierge. Hotel Guest Rates: Overnight self-parking, $35 per night (in and out privileges up to 5:00 PM on departure day). Overnight valet parking, $45 per night (in and out privileges up to 5:00 PM on departure day). Payment: American Express, Visa, MasterCard, Diners Club, and Discover are accepted. Pet Policy: Pets allowed: Yes. Restrictions: Dogs weighing 50 pounds or less, or two dogs under a combined weight of 75 pounds, are permitted. Rates: Up to six nights - $100 per stay; Seven to 30 nights - $100 additional deep cleaning fee; 30 or more nights - A fee will be assessed at the hotel's discretion. Rollaways: Available upon request; fee applies. 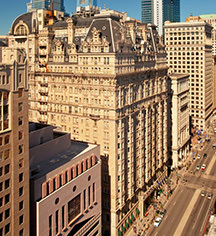 The Bellevue-Stratford Hotel is a landmark building at 200 South Broad Street, at the corner of Walnut Street in Center City, Philadelphia, Pennsylvania. Constructed in 1904, it has continued as a well-known institution for more than a century and is still widely known by its original, historic name. Learn more about the History of The Bellevue Hotel .